A record number of kites filled the skies in ideal conditions on Saturday at the 40th Annual Wright Kite Festival. 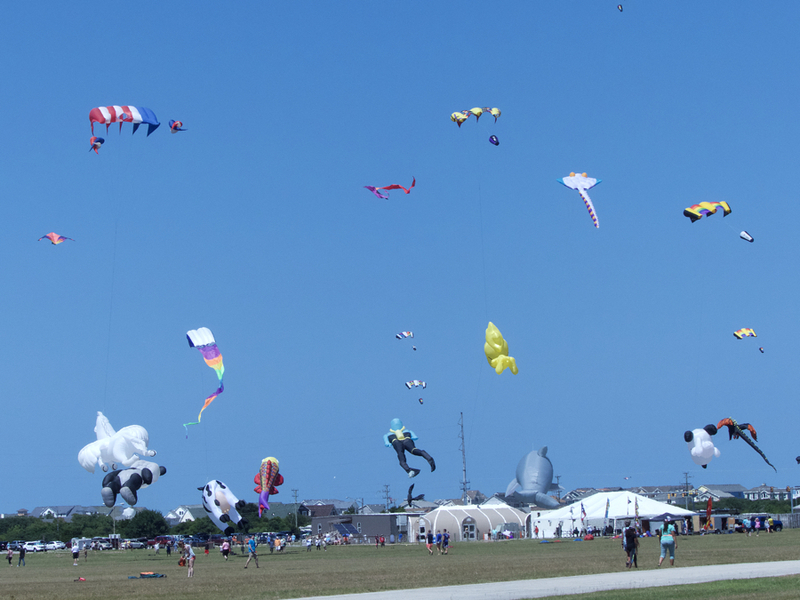 Two days of near perfect kite flying weather greeted the 40th Annual Wright Kite Festival this year, and the kite flyers of Kitty Hawk Kites took full advantage of it. The display that was put on at the Wright Brothers Memorial in Kill Devil Hills was the most spectacular that any of us can remember. We even had a chance to ask John Harris, the President and founder of Kitty Hawk Kites where this year’s display fell in the list of best kite flying days. He thought about it for a moment and said he didn’t recall anything quite like this year. Saturday was especially spectacular with a brisk northeast breeze blowing at a constant 12-15 mph. With relatively few gusts and a consistent wind, a record number of diets filled the sky. There were unicorns, a spaceman, teddy bears, cows, fish, and a collection of large—make that huge—single line kites filling the sky. Sunday was a great day as well—although not quite as good. The wind shifted to the south, and at the Wright Brothers Memorial, a south wind is not quite as good as an east wind for kite flying. What was particularly nice about both days—Saturday especially—were daytime temperatures were tolerable. There have been some years when the heat and humidity of an Outer Banks July day made staying for any length of time at the event a challenge. The Festival is more than just a bunch of kites in the sky. There were stunt kite demos all day. Watching some of the KHK experts work with kids on how to fly a two line kite is wonderful—and the excitement of the kids when they actually get the kite to do what they want it to do is infectious. There were also kite making workshops for little kids. They get to make a sled kite—a very basic design and the nice thing is it really flies. It’s a pretty sure bet the Wright Kite Festival will be back in 2019. It’s always a weekend event, the second Saturday and Sunday of July. There’s always a lot happening on the Outer Banks during the summer. Check our Joe Lamb Jr., & Associates availability to see if you too can be part of the fun.